Remember these guys from last summer? 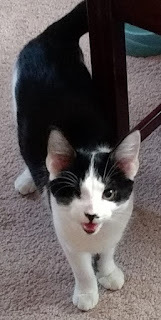 Rooney from the #RatPackKittens was adopted by a very nice couple that have sent a couple of updates and emailed mom last week with another one that they were happy to let us share with you. They renamed him Ragnar. He and his siblings are about 9 1/2 months old now for reference. Rooney was one of the boys that lost an eye to infection as well. It's been a while so I thought I'd give you an update on how Ragnar (aka Rooney) is doing. I can't believe we've only had him for four months! It feels like a lot longer. He's still such a happy, affectionate and silly kitten. We took in a friend's cat because she was living in a bad neighborhood and had to get out but couldn't take her cat to her new home. His name is The Dean, and he and Ragnar are inseparable. They are constantly snuggling, cleaning each other, wrestling or causing trouble. Our other cat Fergus is pretty happy about this situation because he's a grumpy old man and wants to be left alone. Thanks for being so willing to take in kittens and help raise them. 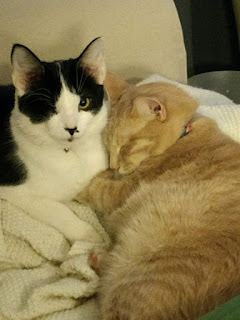 We really appreciate that you took such good care of our Ragnar until he came home to us. I've been following your blog and I know this work can be hard and heartbreaking. I'll try to keep sending you updates on how Ragnar is doing. Ears or his feet. :) He is going to be a big boy if he is going to grow into those things. 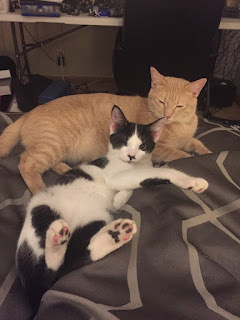 THANK YOU to Ragnar's mom and dad for the updates....we love hearing how our former fosters are adjusting. Sounds like he is one very happy boy. What a fantastic story to start our day with! And it looks like he is very happy with his feline buddy, too. Such a wonderful update! It would be very rewarding to get updates and see that your fosters are doing so well. May he have a long and happy life in his forever home! Oh that is so great to hear from the kitties that you had. What a wonderful home he found. We also appreciate all that you do for all the kitties and cats that need homes. How exciting to get this update! How awesome to see how well loved Ragnar is! That was a great update. Awww! We love updates like this!!! What a great update to get! It must feel good to know you gave him the very best start in life! How nice to know they have 3 happy cats ! Looks like Ragnar has found the purrfect home! He may not have grown into his ears or feet, but he's so big! Excellent news. I hope The Dean gets to stay, as he and Ragnar are obviously the best of pals.